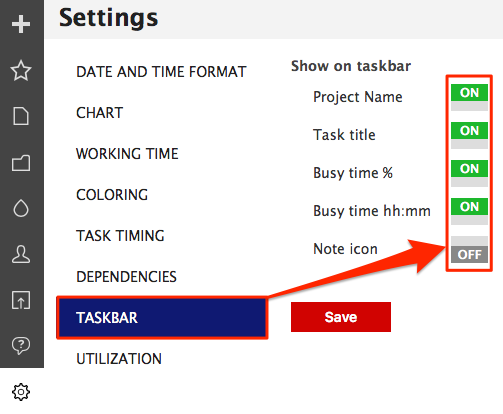 Task-bars are what we call Gantt charts around here. Task-bars are the bars that appear once you drag and drop a task. Or add a task from the + next to a resource title. Whichever you prefer. What matters is that there would be task-bars. If there are task-bars, there's information on them. Or isn't if you choose so. That means you can choose what is displayed on the Gantt charts. The information you need to see without opening the task dialog. Did something come to your mind? Add it to the task-bar! You can add the data of any custom data field you create on the task-bar. You can do that by clicking on the 'SETTINGS' on the sidebar. Doing so will display the items you can show on taskbars. Doing so will hide them or display them on the Gantt chart. Your tasks will now have the information that you enabled. When this notification pops up, click 'OK' and reload/refresh the app/browser. Did not find the answer to your question regarding taskbar information?